Optimus L7 Gets a Price Drop. Should You Get It? JM Balicano September 5, 2012 Editorials, Sale Alert No Comments on Optimus L7 Gets a Price Drop. Should You Get It? LG’s track record with Android updates may be absolute crap, but there’s a lot to love about their affordable Optimus L Series that attempts to combine premium styling in an affordable package. 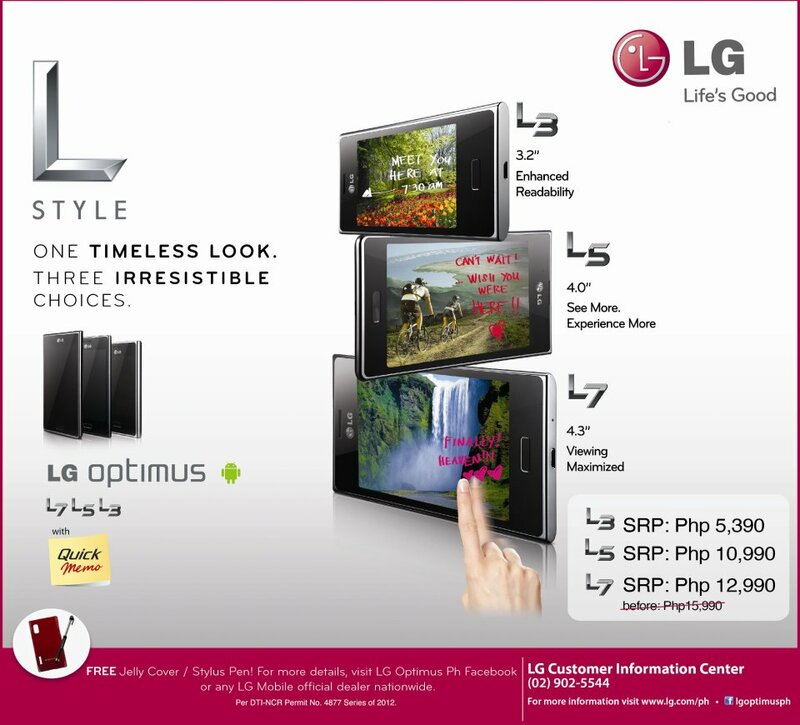 And now it looks like the L7 is getting a price drop from Php15,999 down to Php12,999. That’s a whopping Php3,000! What’s great about the L7 is it exudes premium styling, making it look more expensive than it really is, without compromising too much on the specs. You get a gorgeous 4.3″IPS screen, 1Ghz single core CPU, 512mb RAM, 5mp rear facing camera, and a 1,700mAh battery, all run by Android 4.0.3 ICS out of the box. So how do those specs translate into real life? That screen is going to be gorgeous when you first turn it on. Take note that this isn’t some cheap TFT LCD solution that they decided to slap on the L7. IPS displays are known for their accurate color reproduction and wide viewing angles, and the fact that it’s larger than screens on other phones in the same price point scores huge points. The single core CPU isn’t exactly slow, but seeing as it is coupled with just 512mb RAM means it will quickly get laggy once you start opening more than a few apps or populating the homescreens with information-rich widgets. The L7 might look expensive, but it will still perform relative to its price point. The 5mp rear facing autofocus camera is coupled with an LED flash for low light situations. It won’t be much help though, so don’t use this as your late night camera phone. In normal lighting, the L7’s snapper is just okay, but don’t expect anything mind-blowing. And if you want to record videos, forget about it as you’ll only get VGA quality video at 30fps. Battery life should be quite decent. The Samsung Galaxy S2 came with a 1,650mAh unit and was able to last a day despite featuring one of the most powerful dual core mobile CPUs of its time. The L7 only comes with a 1Ghz single core CPU, which means the battery suckage won’t be as bad. Expect it to keep running for a day, with about 30-40% left when the time comes to charge it at the end of the night. So should you buy the Optimus L7? If you’re looking for a phone you can flaunt without having to spend in excess of Php15k, then yes, this is the phone for you. I doubt there are currently any other phones that feature a quality 4.3″ IPS screen at that price range. On the other hand, if you want a phone that will continue to receive firmware updates to the OS for as long as the specifications can handle it, then you might want to steer clear of the L7. Why? Because LG doesn’t exactly have a stellar track record when it comes to updating their phones’ firmware. Optimus 2X owners are still waiting for an ICS update 10 months after it was announced. If it’s updates you’re after, consider an Xperia phone from Sony as they put the most effort into updating all their phones for as long as the specs can handle it. The update issue aside, the L7 is a stylish smartphone with a slightly underwhelming CPU that will be capable of handling just about any app or game you throw at it, albeit not particularly well. LG G6+ Gets 6GB RAM and Doubles the Storage! LG Tone Studio is a Weird Neckband-style Wearable Bluetooth Speaker! LG V20 Now on Pre-Order, Comes with Php10k Freebie!